Aston Martin was founded in 1913 by Lionel Martin and Robert Bamford and they became associated with luxury grand touring cars in the 50s and 60s. As a company they have specialised in producing cars at home on the racetrack as they are on the roads. Often making appearances at long distance races including the world famous Le Mans, they actually got their start in the hill climbing world. The company has had a bit of a chequered financial history; the company was purchased by David Brown in 1947 with Ford taking ownership in 1994. In 2007 Aston was taken over by a consortium of investors led by David Richards who later became chairman in 2007. Aston’s new CEO Andrew Palmer has big plans for the brand. In 2007 the company had its best ever year for sales with 7,000 cars sold. In 103 years Aston have only sold 70,000 cars! In 2020 Mr Palmer wants to sell 140,000 cars which is quite a substantial number of cars for such a short space of time. To get them to this target the company is launching the new Vantage & Vanquish in 2018 and a SUV titled the DBX in 2019. The other car hoping to be a sales phenomenon is the DB11 which is the machine I’ve had the pleasure of driving. This DB11 is replacing the highly successful DB9. It looks stunning and is amazing from every angle with the car’s wing vents being visually stunning and highly useful – jetting air out of the front wheel arches to reduce drag. The rear spoiler takes air pressure from the back of the rear window and pushes it through the edge of the boot to reduce drag even further. The body is 30mm longer than the DB9 and the wheelbase has been extended by 65mm, achieved by moving the front wheels forward. The car’s suspension has unequal length front wishbones and new multi-link rear with adjustable dampers, steel brakes and aluminium callipers. The car has three ride settings- GT, Sport and Sport Plus. In Sport the dampers are stiffened and steering and throttle response become much sharper indeed. In GT mode the car soaks up good old British potholes with ease and makes for a very comfortable drive, even at speed. To help reduce weight the car has glued and riveted sections which has trimmed 20kg off the slimline DB11. Aston have used a Bosch electric steering system which works very well and feels equally as responsive. 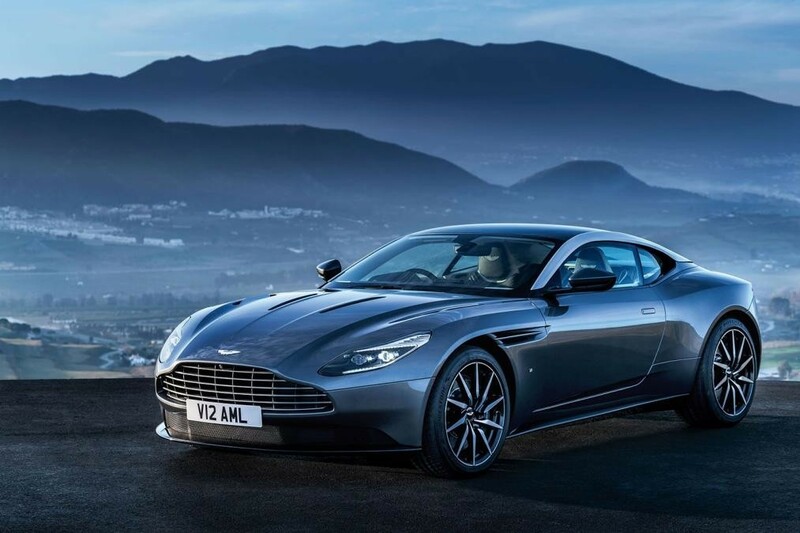 Specially developed 20’ tyres are used to stabilise the car through corners and turns and reduce torque steer, while a new 5.2lt V12 with two turbos has been fitted to the DB11, meaning it pumps out 600bhp and it should be good for 200mph. 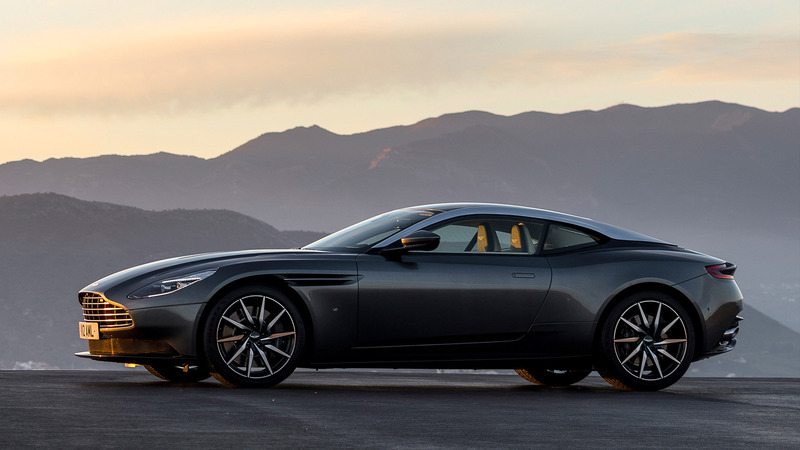 Aston have fitted an eight-speed gearbox to the DB11 and it gets to 62mph in 3.9 seconds. While I had the car I managed to average 17mpg – well off the Aston Martin quoted figure of 25mpg. The exhaust note is still amazing and it sounds so much better than its turbocharged rivals. At 7,000rpm it just sounds amazing. This is partly due to the exhaust silencer valves which allow the car to be started quietly if needed. Stepping inside the car and as you would expect from a hand-made vehicle it’s just totally stunning inside. The new dash and facia help bring Aston up to date and there are a few scatterings of metal especially around the air vents. I hate to say this but I really think the dash looks cheap and no way near as special as previous Aston’s. The speedo and other dials are digital and not analogue like previous DBs and I just don’t think they have the quality of say a Range Rover. I didn’t realise Mercedes own a small stake in Aston but the giveaway for me was the single stork which has always annoyed me about Mercs. A central screen dominates the dash and thankfully the sat-nav and the radio are all controlled via the touchscreen. Previous Astons had a beautifully designed key which was inserted into an emotional control unit better known as a key slot on the dashboard. Potential owners now have a keyless go with a starter button all of which isn’t as fancy but it’s much more practical. The rear seats are ok for youngsters, but I think any adults sitting in the rear would not be comfortable. As you may expect the boot isn’t massive but you should be able to get a set of golf clubs but not much else. This car is a stunning car and it drives really well, priced from £155,000 it isn’t exactly a steal but its only competitor is the Continental GT which is heavier and not quite as nice to drive. Astons MD is going to personally sign off the first 1,000 cars to make sure they meet his very high standards. If you are lucky enough to be able to buy one you will be very happy indeed.